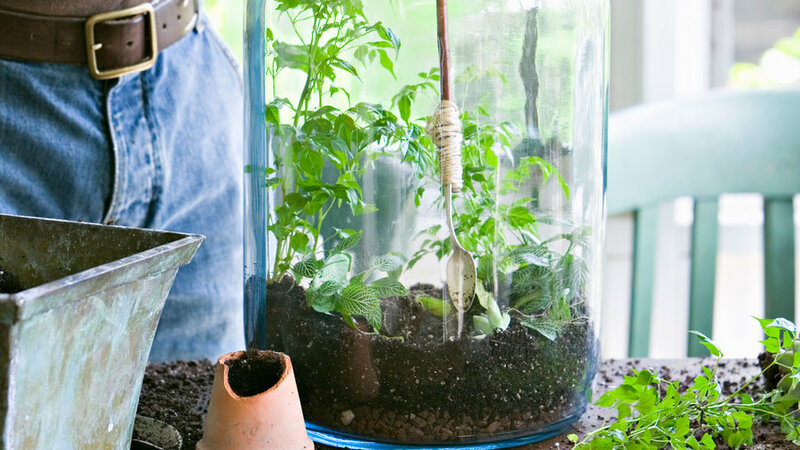 Before diving into plants, it’s important to know if you’re creating a terrarium or an open container garden. While many say they’re synonymous, that isn’t quite the case. 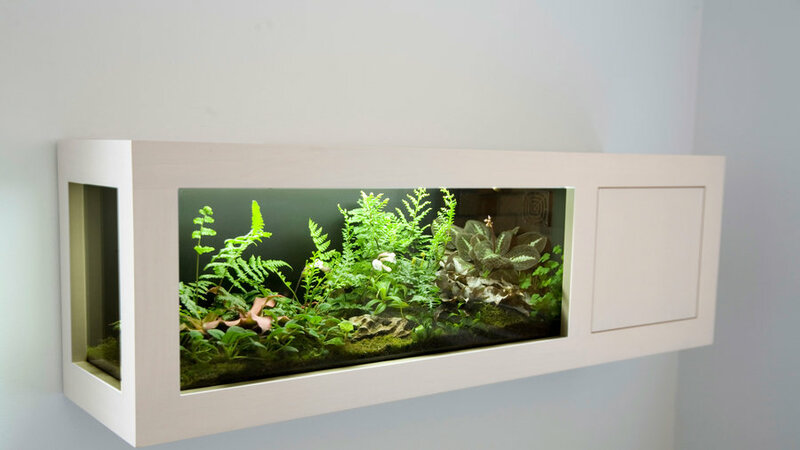 A terrarium is a closed container that produces its own humidity and moisture due to its controlled environment. 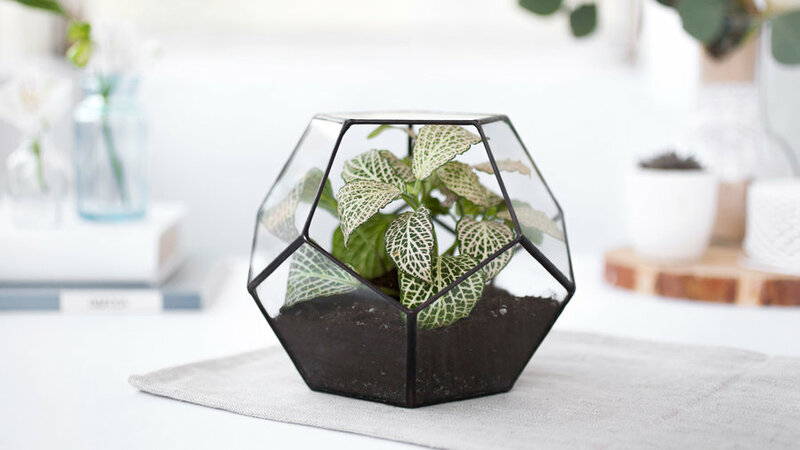 Some terrarium containers include a Plexiglas cube, a glass canister, or a glass fruit jar--essentially anything with a lid. Corked or uncorked large glass bottles also work, as very little moisture will evaporate through the narrow opening. 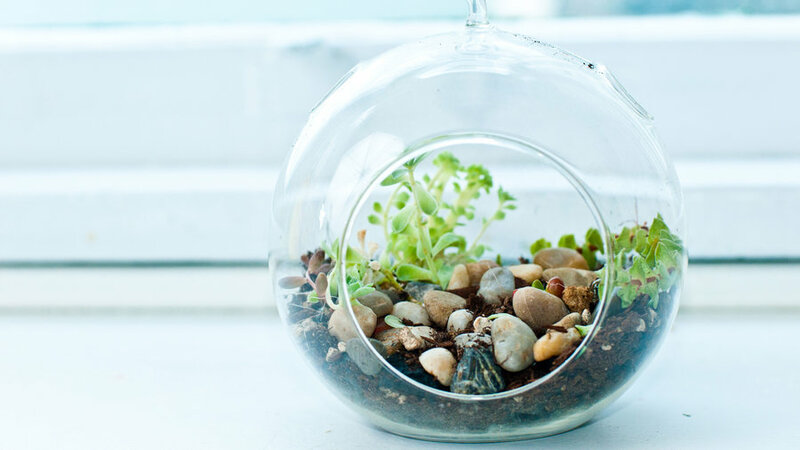 Miniature gardens planted in brandy snifters or fish bowls are actually considered open containers instead of terrariums. These require more regular watering as the open environment doesn’t harbor humidity. Why does it matter? Much like the majority of selections you’ll see here, certain plants require humidity, while others don’t tolerate it. For instance, most ferns and begonias like humidity and work well in terrariums, whereas succulents and cacti are more fitting for open containers. Regardless of which plants you choose, be sure to build a healthy foundation in your terrarium with a bottom later of drainer material like crushed rocks, broken clay pots, or pebbles. Lay out a second layer of charcoal or potting mix before adding the plants. Now that you’ve narrowed down how to pick and prep your container, let’s dig into plants! Ferns generally prefer shady, humid conditions, making great picks for terrariums. Spider ferns (Arachnoides simplicior; pictured here) enjoy minimal light and high humidity and grow up to sixteen inches tall. The maidenhair fern (Adiantum) is also a common choice in terrariums for its lacy fronds and bright green leaves, but it requires some pruning so be sure to keep it in an accessible container. 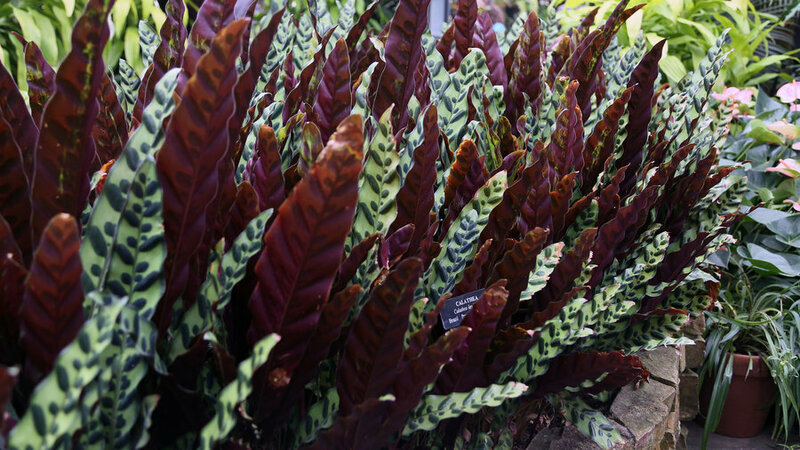 Also known as nerve plant or mosaic plant, this South American native loves warm, highly humid environments with medium light. Lined with white, red, or pink veins, its stiff leaves are an attractive addition to large-bottle terrariums. For a dwarf variety with white veins, try Fittonia argyroneura. Those looking for colorful streaks will like Fittonia verschafeltii. 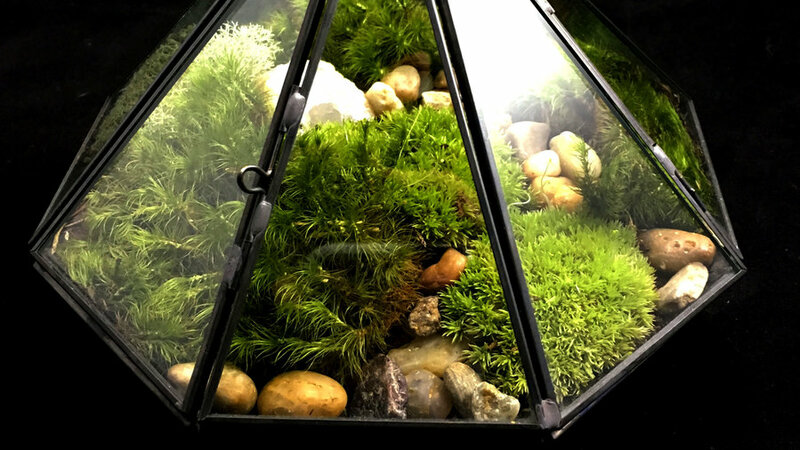 When it comes to design, terrarium tenders can layer plants that vary in height and shape, or keep it consistent by mixing up moss varieties as shown here. combines pincushion moss (Leucobryum glaucum) and reindeer moss (Cladonia rangiferina) inside this striking diamond-shaped container. 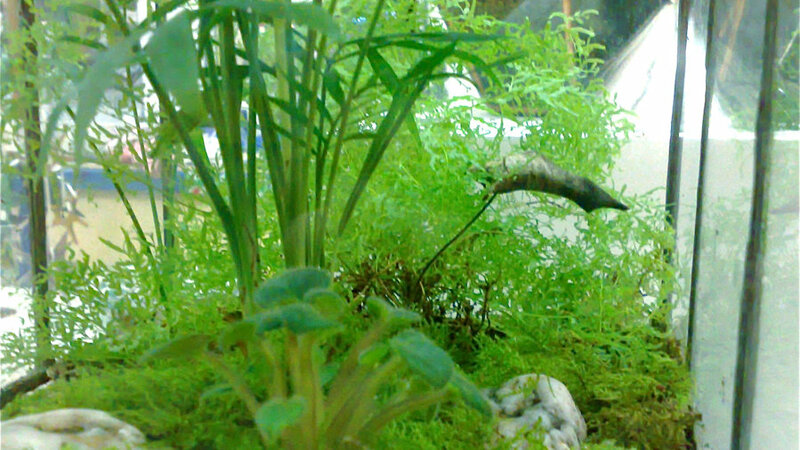 Follow suit or use moss as a groundcover and place larger plants above. 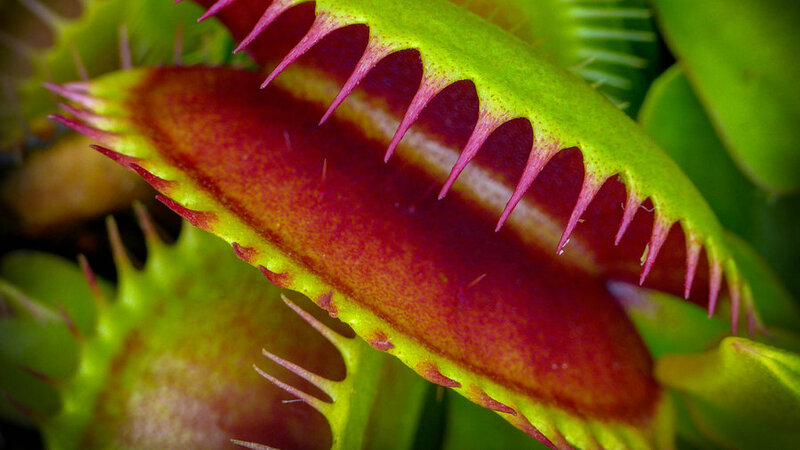 While it’s a carnivorous plant by nature, the insect-eating Venus flytrap (Dionaea muscipula) doesn’t need bugs to survive. It flourishes in terrariums. For an ideal environment, plant in sphagnum moss, add a little sand and leaf mold, keep it moist, and position in full sun to bring out its deep red hues. Also known as table fern or Victoria fern, these tropical plants come forked with color and texture. With so many varieties to choose from, start with silver lace (Pteris Quadriaurita ‘Argydraea’), Pteris Cretica ‘Albo-Lineata,’ or Pteris ensiformis (pictured here). 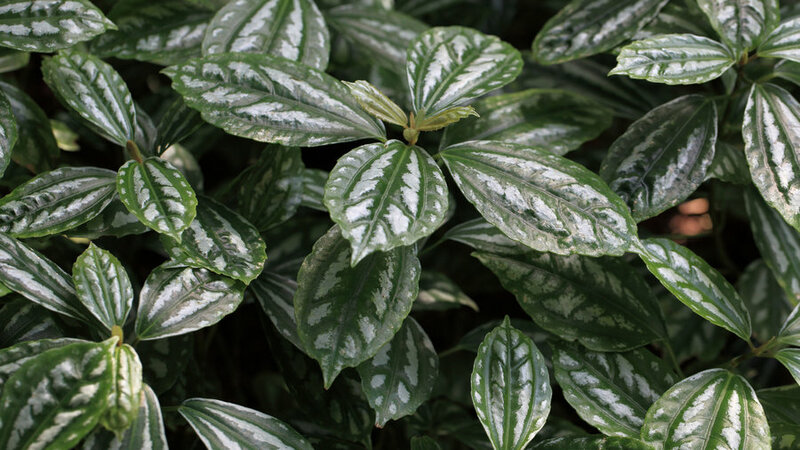 These juicy-stemmed plants come with full leaves and varying textures, but can easily become leggy as they reach for light if put in too much shade. Plant in regular potting mix with good drainage and try to maintain moist, but not soggy, soil. 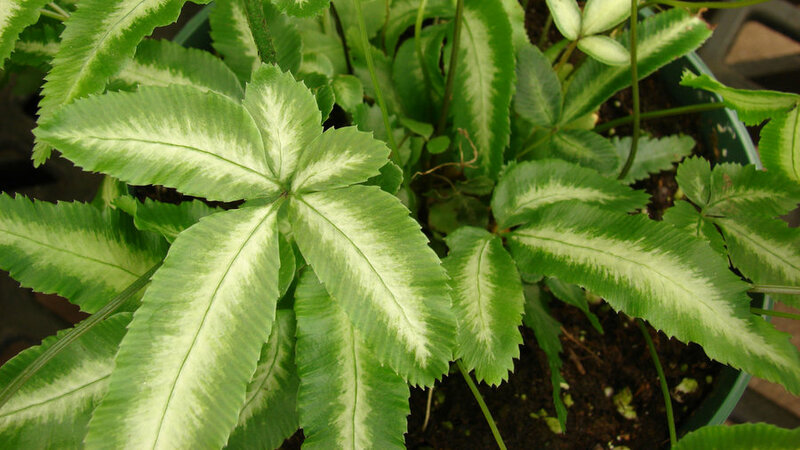 For silver-brushed leaves as shown here, plant Pilea cadierei. Other noteworthy varieties include Pilea microphylla for its bright, fernlike leaves, or moon valley (Pilea mollis) with its maroon center and lime-green edges. This gorgeous, patterned plant peacocks in any garden with its uniquely marked leaves coming in shades of green, white, and pink. Hailing from both Africa and the tropics, these plants want a warm, moist atmosphere for optimal living. Plant in standard potting soil with good drainage in filtered sun. 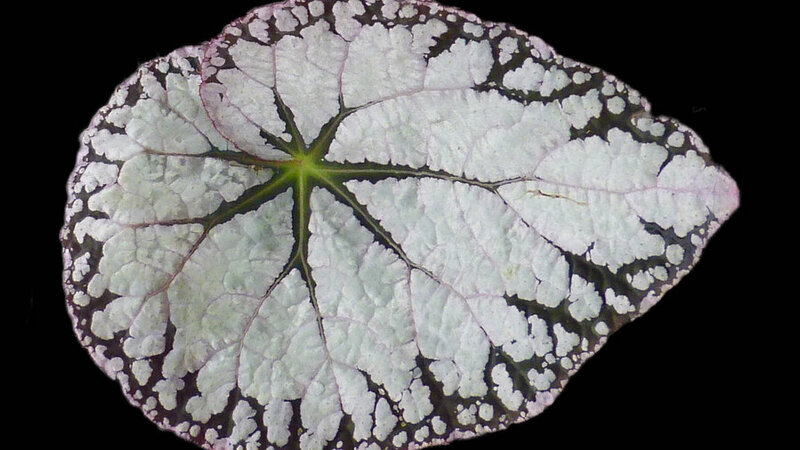 When it comes to begonias, try ornamental foliage varieties like silver lace (Begonia imperialis; pictured here). This fuzzy-textured plant commonly grows in Florida and Texas, hence its affection for warm, humid environments. Begonias tend to sprawl and need quite a bit of pruning, so when working them into terrariums try dwarf varieties and keep the soil moist versus wet to avoid rotting the roots.